I have been in Germany now for about a week and a half. I am very slowly adjusting to life in a foreign country 4,391 miles away from my home (according to my GPS). I am staying here with a local sculptor named Martina Kreitmeier who I met at an artist residency in Virginia earlier this year. Tina lives in the small farming village of Vilsheim 44 miles south west of Munich. Driving is so different here. When ever we go somewhere we travel on narrow country roads that weave through the beautiful Bavarian countryside connecting village to village. If we do end up on a highway it won't be the big interstate highways I am used to in the US, these highways are usually just two lanes of opposing traffic with no speed limit. Thankfully I have yet to see any of the strip mall sprawl that is so common back home. Everything here I see looks very well built, solid and classic. I have not seen one home with asphalt shingles. Every home, out building, barn and store in Germany has a clay tile roof. This is a roofing system you would only see on the most expensive of homes in the USA. The stores are tucked into the quant village centers sporting very modest signs. I went into our local pharmacy and every thing was lined up on wooden shelves like I see in the old movies that date back to before the 1950s. Here the cities often have the old city center with buildings dating back to the middle ages and then on the outskirts you will find the modern architecture, but again, these are usually very nicely built when compared to American building standards. Many of the larger German cities like Munich and Dresden where completely destroyed during WWII and needed to be rebuilt. I have not witnessed these cities yet. Last night I was at a beer garden for a free local music festival. Let me paint this picture, imagine forty to fifty long wooden tables with benches neatly positioned under six towering ancient chestnut trees. Every table is completely full of people eating Pommes frites (French fries) with mayonnaise and sausages. Everyone of course has a tall beer in giant liter size glass mugs. Up at the front is a "rock band" of youngish looking guys playing a very Bavarian version the Ghost Busters song complete with accordion, stand up bass, classical guitar and a small drum kit. Oh yeh, and their wearing lederhosen which, in case you don't know, are long cut leather shorts that look like they would last a lifetime and seldom need washing. (dry clean only?) They lace up the side and are sometimes beautifully embellished with floral patterns both tooled into the leather and or embroidered. I'm a talker and left my crippling fear of people back in high school but being here in Deutschland only knowing a smattering of German words is presenting a real challenge to my ability to connect. Most of my conversations begin with a timid, "Do you speak English?" which usually quickly leads right into a brisk talk with an occasional "Oh, ah...how do you say..?" complete with wrinkled forehead and finger tapping to the temple, but otherwise faultless English where at some point they almost always apologize for their poor language skills. And then I'm thinking of how I made my flash cards and downloaded my learn to speak German apps on to my phone but still only have the command of a fist full of very basic German words and phrases. Two nights ago Tina and I were eating dinner at a beautiful out door restaurant in the medieval city of Landshut next to St Martins church (The tallest brick tower steeple in the world btw). I needed to go to the bathroom so I rehearsed how to ask for directions to the WC with Tina in her mother tongue. Going inside the restaurant I said in my best Bavarian accented Deutsch to the first wait staff I saw, "wo ist die Toilette?" to which he replied "Around the corner, down the stairs and just to the left" in perfect English with hardly a trace of an accent. WTF, Really?!?! This environment is enchantingly beautiful and quaint but it is also very different in so many ways. I know that getting acclimated to a foreign country takes time but sometimes I feel overwhelmed by the challenge and sort of adrift; sometimes I feel almost disembodied from myself and lost. Much to my relief I am finding that continuing with my art making practice while I'm here is what the doctor ordered doing in order to keep me grounded. 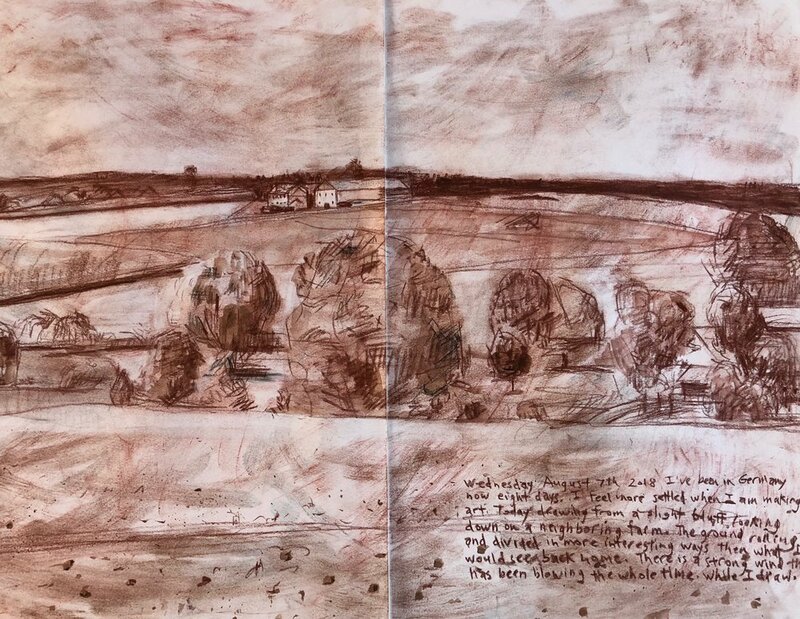 Yesterday I took my little beechwood travel easel strapped to one shoulder along with my old leather bag full of paper and drawing materials slung over my other shoulder and I walked the tree line up the hill, out side my pig barn studio, looking for a place to draw. In a short time I settled on a wonderful view that looked out over the valley dotted with poplar, linden and oak trees. The fields, some recently harvested, some just plowed, and still others standing tall with corn, looked almost like a victorian crazy quilt or better yet, they looked like a Grant Wood painting. I set up to draw in the shade of the oaks sitting in a grassy path littered with a slender kind of acorn that I had never seen before. Over the next three hours I covered my paper with red and brown chalk along with touches of sienna water color. Taking a few breaks for stretching and picking wild black berries, I put the finishing touches on my drawing and then packed up my easel. By the time I was walking over the threshold of my studio I felt surprisingly, right at home.